On February 1, 1876, the Secretary of War was notified that the Indians refusing to return to the agencies were deemed hostile. General Crook was instructed to reduce the hostiles to subjection. General Sheridan planned to converge three columns near the Indians’ main camp – one moving northwest under Crook from Fort Fetterman, one under Terry and Custer moving southwest from Fort Abraham Lincoln, and one moving southeastward on the old Bozeman trail under Gibbon from Fort Ellis. On June 17, 1876, with about 1,000 Sioux and Cheyenne warriors, Crazy Horse engaged General Crook’s force of 1,200 men in an extended battle filled with maneuver and generalship — the Battle of the Rosebud — where the Indians charged and retreated repeatedly, splitting up Crook’s forces and keeping them on the defensive, and finally driving the troops into a retreat or grouping. The Indian camp, made up of large contingents of Oglala, Miniconjou, and Hunkpapa, with smaller contingents of Brule, Sans Arcs, and Blackfeet-Lakota, was several miles long, on the opposite side of the river from Custer’s approach, and hidden partially by the trees and brush along the river The Cheyenne had a fairly large representation, with smaller numbers of Santee and Arapaho. While there were several thousand Indians in the camp, moderate estimates are that there were only about 1,500 to 2,000 warriors who engaged in the battle. 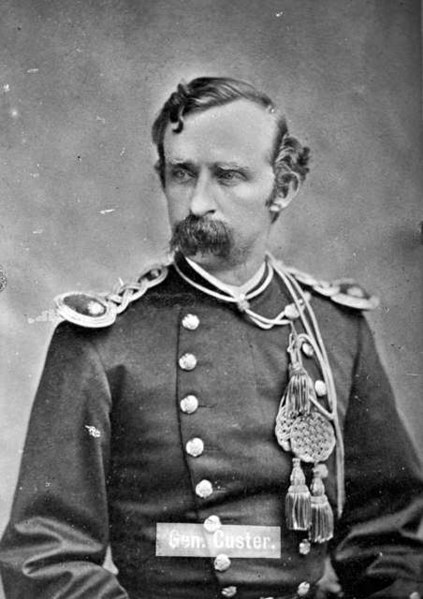 Custer split his force of 597 troops and officers, plus 50 scouts, into 3 parts, against standing orders not to do so, left his ammunition train behind and sent Major Reno off to attack one end of the camp, while he led 5 companies toward the other end. But he never made it. Hunkpapa Chief Gall led some warriors against Reno, and then charged after Custer’s force on Custer’s side of the river. Crazy Horse led more warriors up the length of the camp, crossed the river and blocked Custer from the other side. Trapped between these warrior forces, without reinforcement or his ammunition supplies, Custer and his 207 troops were wiped out. Major Reno’s command lost 57 men, and remained in defensive positions until Gibbon’s infantry arrived the next day.